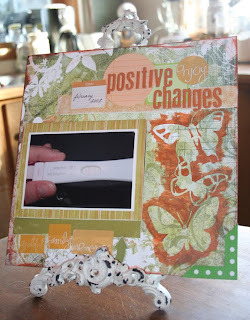 This is the page about finding out I was pregnant with Isaac. The next two are pages from our trip to PEI. Where all of us (minus Isaac because he wasn't born yet) met the ocean for the first time. I had only seen it from an airplane up until that point. It was as magical as I though it would be. I think a piece of my heart stayed on the beach in PEI. I am also aware that it is supposed to be she sells sea shells by the sea shore, Brad filled me in after I glued it all down!! *rolling eyes* I would have been fine to know it as sea shell, sea shell by the sea shore but now I have to look at the page every time and know it is wrong. This is probably my favourite Basic Grey line of all time, Urban Prairie. I love the colours designs of all the papers. This is about Annaley and Avery's first day of school, I cried...don't all moms? I was fine about the school but the school bus made me cry, they just seemed so small to be getting on a bus by themselves! At least they had each other though. I have quite a few more done but I have yet to take pictures of them. I usually scan them as well but since we moved to the farm I have not been able to find my scanner cord! I probably shouldn't call it a scanner anymore and switch the name to dust collector. 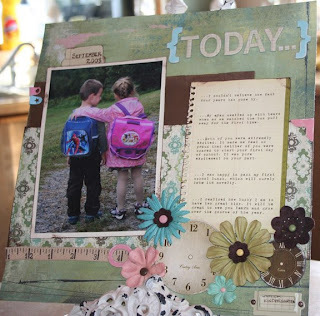 Hey Mandy....your scrapbook pages are awesome!! Do you do them by hand or on the computer? I was just thinking how you have so many nice embellishments it must cost a fortune! Or....where do you get them?...I love them!